It's a shame that Brian Clough's family don't want to see the film,because they think it's based on the awful caricature of him in David Peace's book. This film is totally different, it shows Clough to be a vulnerable, sensitive, kind and well-meaning man, who used the bluster for which he became famous to cover up weaknesses he felt he had. 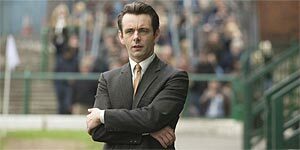 But he was also a hugely charismatic and intelligent man, and highly principled, and Michael Sheen's performance captures this perfectly. The guy is brilliant as Clough, perfectly capturing that Teeside accent. What made people think Mike Yarwood sounded *anything* like him, I'll never know. Having said that, the people who suffer in this film are the Leeds players and manager: they are the ones who become caricatures. Don Revie was a much more complicated character than portrayed here, and from accounts of people who knew him, Billy Bremner was a lovely man off the pitch, and nothing like the snide schoolyard bully this film makes him out to be. Overall, though, I *really* enjoyed it, especially the reunion between Clough and Peter Taylor... Fleetwood Mac's music is used to powerful effect. I agree - you don't have to be a football fan to enjoy this film - it's all about personalities. But you do have to be a classic car spotter to appreciate all the 70s cars making discreet appearances in the background!